We specialize in offering Super Fine Air Filter to our valued buyers. 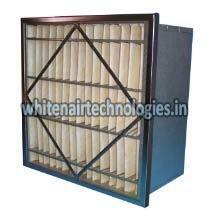 The Air Filter is ruggedly designed and shows excellent performance characteristics. Quality materials are used and each unit is pressure and leak tested, to ensure durability, longevity and hassle free operation. We are an eminent Manufacturer & Supplier of Super Fine Air Filter from Telangana, India and known for our fair pricing policy. Non woven filter fabrics is used in fine or Microvee filters which have filtration capacity of 5 micron and larger particles.